The pattern of wind has been the same now for nearly three weeks – a calm morning followed by a gradually rising north, or north-easterly breeze. We have had no rain or big weather events and there is plenty of bait around. The fish should therefore settle into some regular habits and spots and that seems to be the case. The Flathead are where you would expect them to be, on the edges of sand bars and weed beds, moving up and back with the tides. 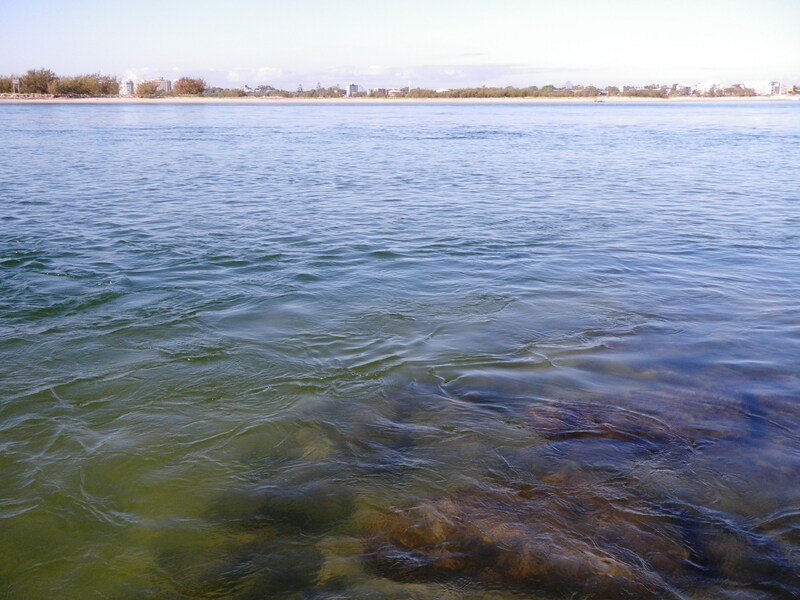 On Saturday I went back to Caloundra to see if I could find the Trevally again, but with low tide at about 8.00 am, there was a bit to much water for me too cast over, to get to the main channel. The Flathead where still around though, and I caught three in amongst the rocks at Bulcock Beach between first light and just after 6.00 am. I dropped a couple more as I tried to steer them to the beach. I was using the GULP Crazylegs Jerkshad in the Pink Shine and Black Shad colours, on a 1/6th 1/0 jighead. Three of the Flathead were over 40cm and a couple where a bit smaller. It was Saturday morning and the Jetskis, boats, swimmers and boarders were stirring things up a bit, so I decided to move down to Golden Beach. It was time to feed my new hard bodied lure addiction. 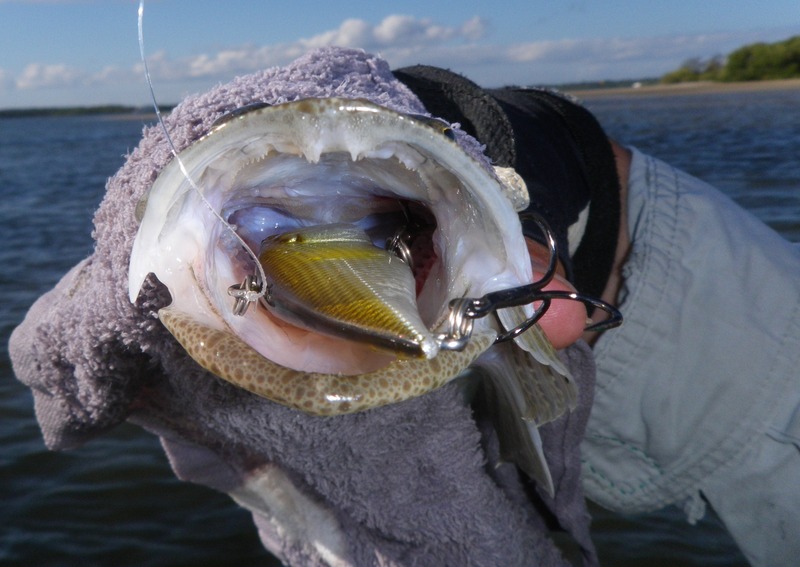 I pulled out the latest try out – the CULTIVA MV 60S-06 Miravibe, 9.5g, 60 mm long – a bibless sinking vibe lure. CULTIVA is and Owner brand, so not surprisingly, the treble hooks are tough, sharp and a bit larger than the lures I have been trying out recently. There is no rattle in this one, but the vibe action is so tight that it almost sounds like there is, as it travels through the water. It looks very like a small Herring and I chose a yellow/bronze colour that seems to work well in the Pumicestone Passage. I walked out in front of the Gemini Towers apartment complex and found the edge of a small channel. I cast the lure parallel with the bank, hopping it along the bottom in short bursts. 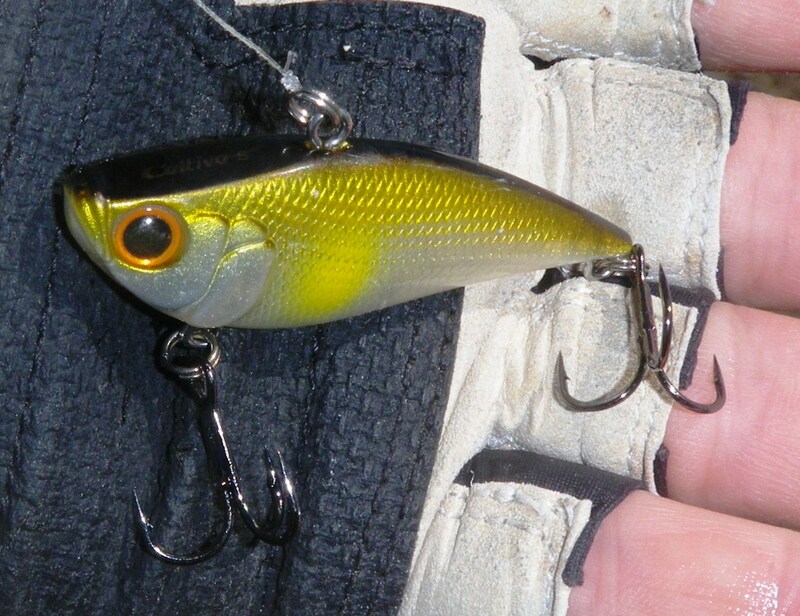 The problem with this lure is that you have to move it slightly faster than I would like, to keep up the wobble. As they often say ‘no wobble, no gobble’ – so you have to keep it moving all the time. I covered a fair bit of ground, travelling south and casting along the edge of the channel. Suddenly I felt a bite and short run but then the fish was off. I stopped and cast back in the same spot, pulling the lure across the bottom in shot sharp jerks – to get the maximum vibration. This worked and the fish (or another fish) grabbed it. 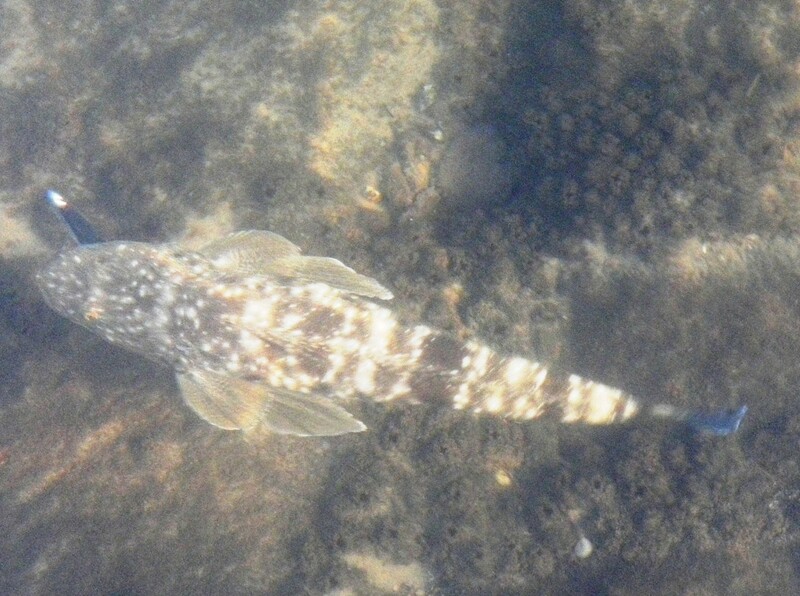 It was another Flathead about 45cm long and it had thoroughly inhaled the lure. After a pretty complex extraction I released it. Another lure had passed the test and caught another fish. I suppose they all work in the right circumstances but I found this one a bit difficult to fish with. It seemed to take a while to find its rhythm in the water and I am not sure if bigger trebles help or hinder the hook up. More tests required. At about 9.30 am I gave up and went for a dip on Kings Beach. A few fish, a swim in the ocean and a fresh cup of coffee overlooking the surf – life’s good! This entry was posted in Caloundra, Fishing Reports and tagged CULTIVA Miravibe, land-based fishing on the Sunshine Coast, landangler. Bookmark the permalink.